Wordless Wednesday: Cheers! À votre santé! Prost! Salute! One of my dearest friends and a fellow art/food lover is currently travelling around Italy with her partner, J has been wanting to visit Italy for many years and I am so excited that her time has come and that she is getting to see the chaotic city of Rome and the beauty of the countryside. It also means that I’ll have someone else to talk Italy with and she hopefully won’t get that glazed look in her eyes that I see in others when I’m daydreaming aloud about my holiday. Today J will be travelling through Tuscany and spending time in Florence, on my desk is a copy of her itinerary and it is great for reminiscing about our trip and the various cities and towns we visited. My first visit to Florence was in 1999, I was travelling alone so had signed up for a tour, not everybody’s idea of travelling but perfect for a shy, single girl who had mainly travelled overseas with family. The David was a highlight for me, at that stage photography was allowed in the gallery so I made sure I captured him from all sides, the rest of my (short) time in Florence was spent on the hunt for a leather jacket and eating delicious pizza in a restaurant near Basilica di Santa Croce. There was no time to rub the nose of the boar on the Ponte Vecchio, nor did I try the local gelato and the Uffizi was not even on my radar, however I did get to see the interior of the Duomo and Basilica di Santa Croce and began to appreciate the influence that religion had on art and architecture. 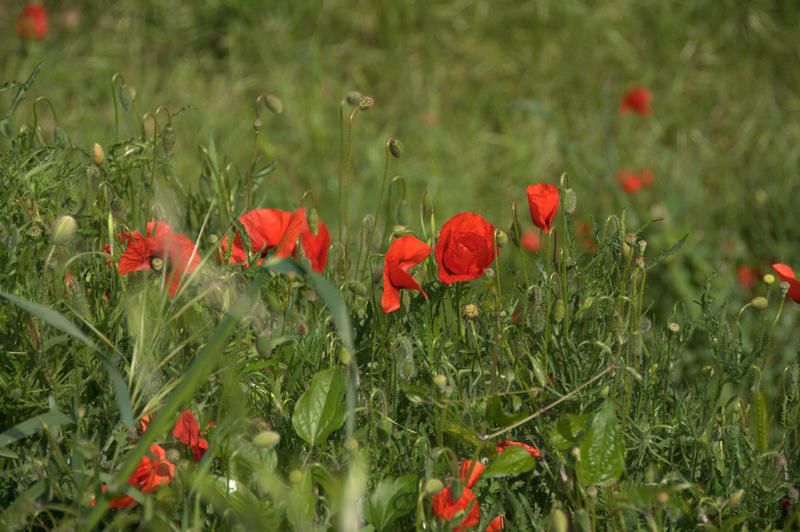 Apart from driving through the countryside to reach our accommodation in Pontassieve and stopping for a quick visit at Pisa to see the Leaning Tower, there wasn’t a chance to really see much of Tuscany so I made sure that we spent some time in a Tuscan hill town on our last trip. 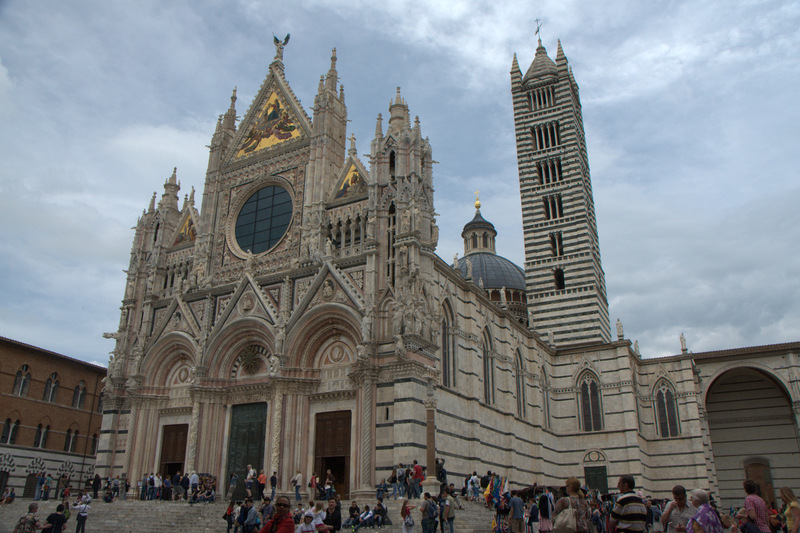 Last year we spent three nights in Florence and four in Siena, we could have stayed longer however I was keen to also visit a few towns in Umbria and didn’t want to waste time hopping from town to town each day. Florence the second time around was a different experience, we didn’t have a set schedule although there were a couple of things that were a must: The Uffizi, climbing Brunelleschi’s Dome, Boboli Gardens, a cooking class and the Ponte Vecchio. The aim was to also spend time just enjoying the city: walking along the river, drinking coffee or a glass of wine in a piazza, exploring the food markets and doing a bit of shopping. I am hoping that J is able to enjoy some of the simple pleasures and not spend all of her time racing from tourist attraction to tourist attraction, however, when you spend over 24 hours on a plane and several thousand dollars in plane tickets it is important to make sure that you see everything you want to see. 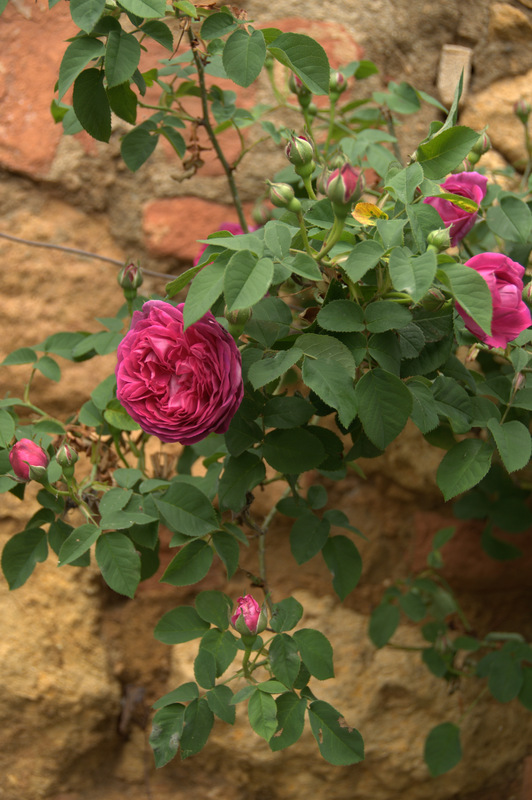 Images from our short stay in Siena, we ventured into the hilltop towns of Volterra and San Gimignano and spent a day driving between Siena and Pienza to catch a glimpse of the scenery that is so typically Tuscan. Although I didn’t do the driving on our recent trip to Europe, sitting in the passenger seat armed with a map and a plan for for the day’s adventures meant that I got to navigate. Our car, a little Fiat Panda, came with a GPS (for only 70 euros extra) which I called George. George took some getting used to, I like to have an overall view of the direction we’re heading in so I had one eye on the map and the other on George. I learned a couple of things from George, the taxi driver took us the long way to the rental car office and don’t always trust George’s shortcuts. In Australia we drive on the left side of the road, In Italy it is the opposite but constantly telling my husband to drive on the right side of the road got a bit confusing because to us the left is the right (correct) side of the road to drive on. ‘Other side’ was the preferred option but thankfully it didn’t take too long for him to get used to. 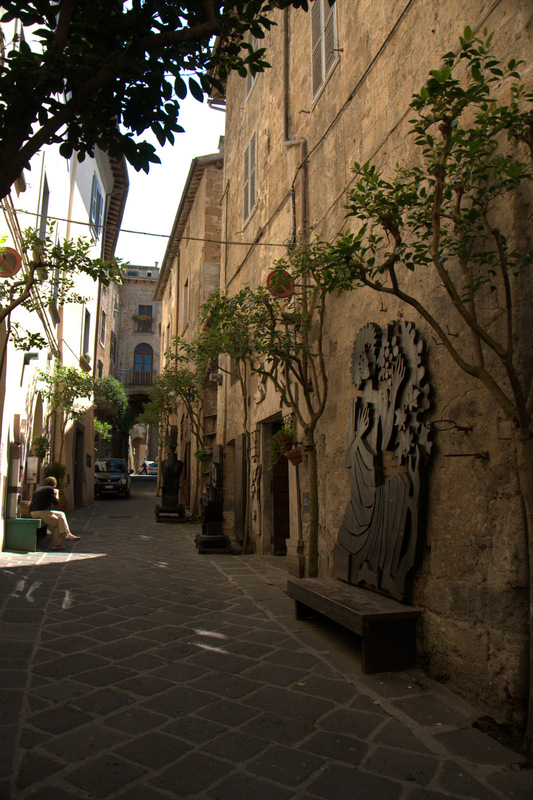 We only hired a car to get around Tuscany, Umbria and make our way down to Sorrento from Assisi, that was plenty enough excitement for me, the trip between Naples and Sorrento was a tad stressful even for a passenger. Country driving meant narrow, winding roads with regular photo stops, near Naples we got caught in a traffic jam as a result of a motorbike accident and in Sorrento you have to be mindful of scooters, cyclists, women with prams and the occasional horse and cart. The ZTLs (zona traffico limitato) are areas of Italy that you are not allowed to drive in without holding a ZTL pass. Tourists can’t get these passes and are only exempt if your hotel provides all the license and registration details of you and the car to the relevant authorities. Thanks to a misunderstanding with George we almost ended up driving into Siena’s ZTL, I had a massive freak out because I thought we were bound to get a fine sent to us but we found a way out of the area we were in without entering the ZTL. In Assisi we were told by the hotel just to drive through and if we were stopped by police, to tell them where we were staying and all will be good. We didn’t see any police and I’m sitting here hoping that there weren’t any cameras either. Paying for parking was a common occurrence, anywhere from 6 euros for a few hours to 20 euros for a couple of nights. 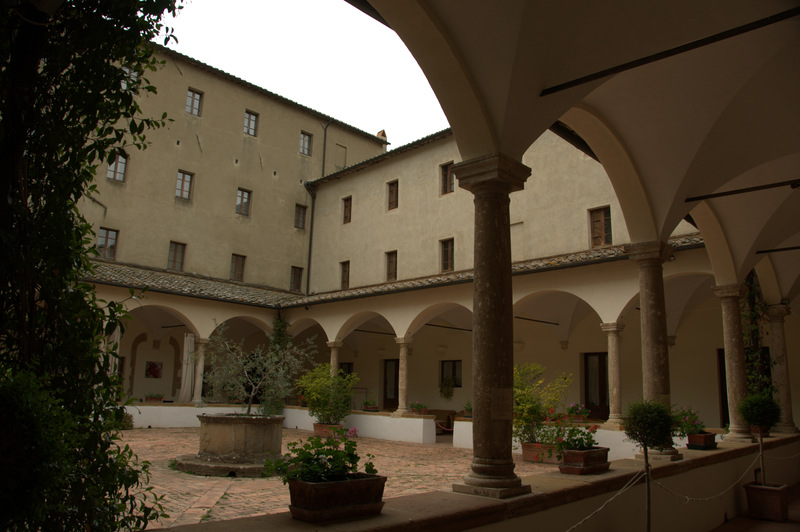 Our accommodation in Siena and Orvieto had free parking, Assisi provided a discount card for parking in the council car park because they didn’t have any parking for guests. Would we hire a car again? 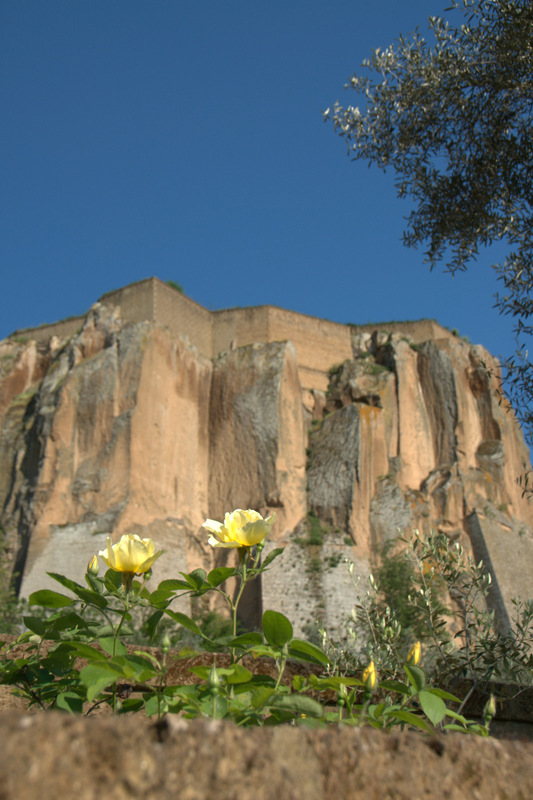 Possibly, it certainly was handy getting to little towns such as Civita de Bagnoreggio and Volterra, public transport is available however it can be slow and not at all regular. Fuel didn’t cost as much as we thought, the Panda was an extremely economical car for the two of us and we probably spent a maximum of 90 euros over the 10 days of driving and that included the filling up of the tank before returning the car in Sorrento. The rest of the time we used public transport to get around, trains between the major cities are fast and easy to use, not to mention cheap. Since arriving home we’ve been asked about our favourite destinations and experiences and it is really hard to narrow it down to one or two things, so much of what we have experienced has been incredible and we loved (almost) every minute of our trip. Marty and I also differ when it comes to selecting our special moments, Marty likes to sit and watch the world go by, meet new people and enjoy the moment whereas I like to get moving and explore each destination and what it has to offer. For those of you who are interested, here are my top ten favourite experiences and my top ten less-than favourite experiences, some of them you may already have read about in previous posts. Walking through the doors of the Musee d’Orsay and making my way through the Impressionist collection. Degas, Renoir, Monet, Manet and Seurat were the artists who inspired me when I was in High School and changed the way I looked at my surroundings. A perfect day in Bavaria (a very small part of Bavaria anyway) starting with a scenic train ride through the countryside where we met two lovely German ladies and spoke about The Thorn Birds, Brisbane’s floods and the beautiful region we were travelling through. Joe, dressed in traditional clothing met us at the Füssen train station, we took a horse and carriage ride up to Neuschwanstein, drank beer on a snow covered mountain and that evening we had dinner with Joe’s family at his mother’s house. Waking up in Paris, the realisation that we were finally in Europe hit and it was bliss! Paris is an amazing and fascinating city and 5 nights was just not enough, we can’t wait to go back there and spend more time exploring the streets, gardens and museums. Eating piping hot frites (chips) covered with a huge dollop of mayonnaise from the Mannekin Pis frites shopfront in Amsterdam, it was cold and miserable and these were the most delicious things to eat on such a day. Staying in the medieval towns of Bacharach and Rothenburg in Germany. These towns are straight from a fairytale and they were in the most picturesque places, Bacharach on the Rhine River and Rothenburg ob de Tauber surrounded by medieval walls overlooking the valley. Wandering the streets of Venice and watching the colours of the buildings change as the sun was setting. Truly a magical place and more so in the evening when the crowds have thinned out and the souvenir stalls have closed. 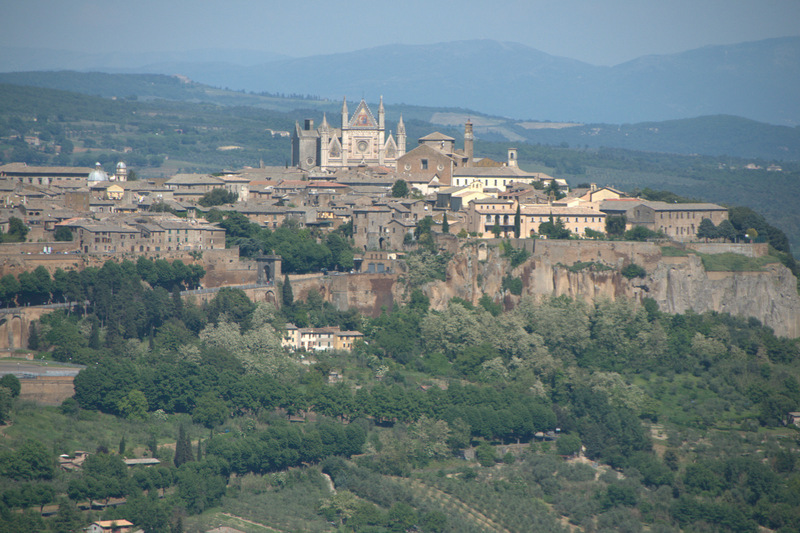 The hilltop town of Orvieto was a wonderful destination, we enjoyed the local wine: Orvieto Classico accompanied by snacks of marinated olives, foccacia and peanuts. 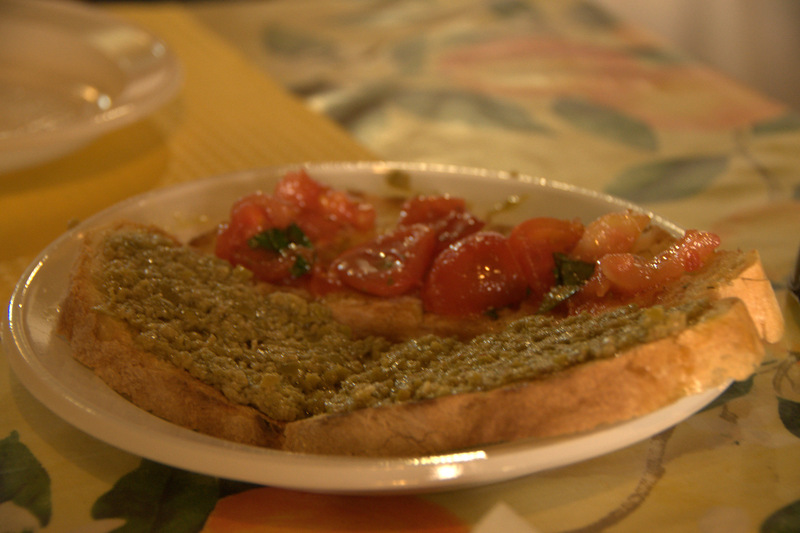 From Orvieto we visited the dying town of Civita de Bagnoregio, a hilltop town with few residents thanks to ongoing erosion of the volcanic stone that the town sits upon, here we had a most delectable meal grilled over an open fire and served on plastic plates. Participating in a cooking class in Florence. This was loads of fun and not only did we learn a little about Tuscan cooking, but we were able to enjoy the fruits of our labour accompanied by a few glasses of wine and all of our classmates. Rome, everywhere we walked history smacked us in the face from the ancient roman ruins, influential architecture and Egyptian obelisks to Baroque sculptures on display in piazzas, fountains and churches. 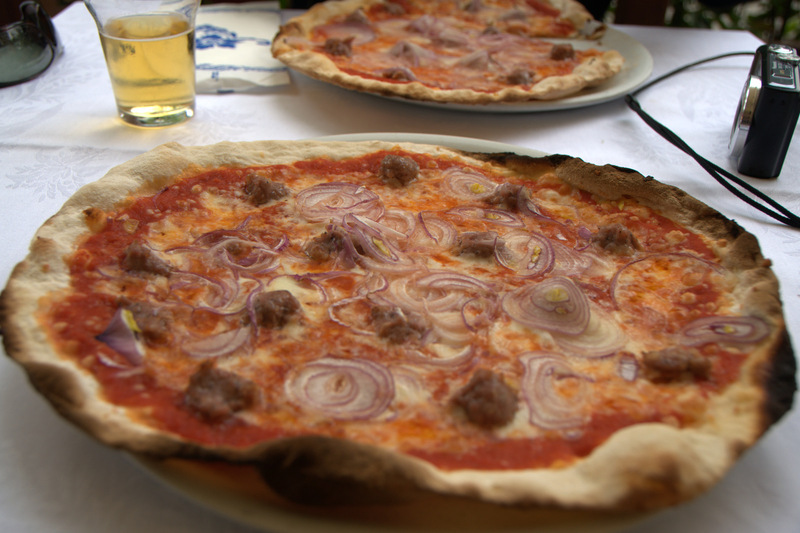 The traffic was crazy, the crowds overwhelming and the food served at Cantina Kantarini delicious, an amazing city. 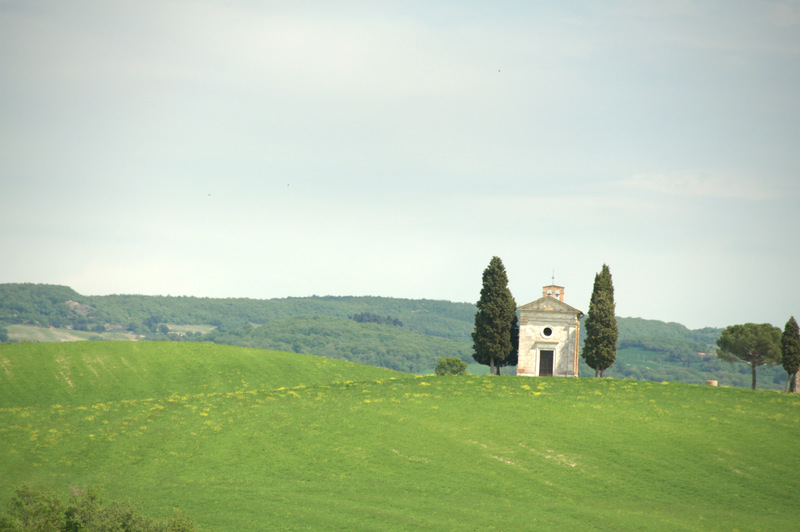 Driving through the countryside in Tuscany and Umbria, being in the middle of a scene that I had only ever seen on postcards or calendars. 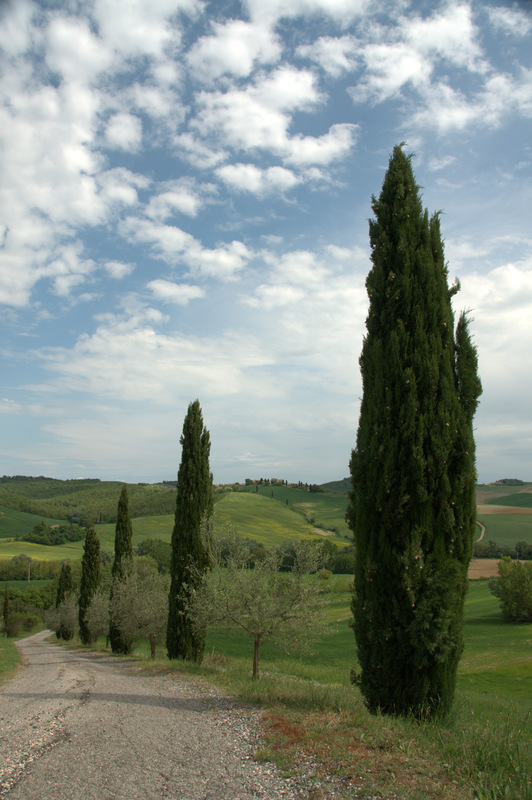 When driving between Siena and Pienza we must have stopped at least 20 times to take photos and absorb what we were seeing, rows of cypress pines and olive trees, red poppies and Tuscan villas. Feeling stressed about the driving in Italy, even though I was the passenger and GPS/map reader. We didn’t know how the tolls worked or how much it would cost, the limited traffic zones made me nervous after reading about the cost of the fines we could get and driving through Sorrento was a little chaotic, narrow streets with bikes, scooter, horse and carriages and women with prams all vying for road space. Finding our room not ready in Florence and having to spend potential ‘tourist’ time checking out of one hotel, storing luggage and then checking into the hotel we were originally booked into. Not only that, both hotels were extremely popular with school groups. Eating crappy, expensive pasta at a tavola calda near the Vatican City, we knew better than to make a rash decision however we were hungry and running late for our tour of the Vatican Museums. Honestly, Hungry Jacks would have been better and cheaper. The pane (bread) charge of 3 euros for the bread we never ordered was also annoying. The crowds in the Vatican Museum made it really difficult to spend time absorbing our location and the marvellous things we wer looking at. Next time we’ll book a private tour either early in the morning or later in the day, the money spent would be well worth it. Missing out on the Borghese Gallery because I didn’t try to reserve a ticket far enough in advance made me furious, I knew better but wasn’t sure what our plans were for Rome because a friend of ours was joining us for a few days. I should have just booked the ticket regardless. Accidentally deleting all my photos from my computer and having to download them all again from the memory cards, sadly we had deleted some of the images from the memory cards resulting in some happy snaps never being seen again. After that I backed up photos online, on my laptop and on usb sticks. Not making use of the metro and buses more in Paris, we walked everywhere unless the hop-on, hop-off buses could get us there (and only for a period of two days) and we were exhausted and short tempered. We walked because we wanted to ‘see’ Paris and instead it ate up valuable time that could have been spent in the Luxembourg gardens, Rodin Museum or people watching at a cafe. Rude tour guides in museums and galleries who think it is okay to stand right next to you and start spouting their knowledge to their tour group regardless of the fact that you’re trying to listen to an audioguide. Paying 22 (for 2) euros to enter Pompeii, 10 euros for the audioguides and map and finding that the majority of the villas and more interesting places to see are closed for restoration or repairs. No mention of this on the map or the guides and certainly not explained to us when we bought the tickets. Although a great place to visit, it was extremely disappointing. Getting ripped off by those International phone companies that ‘help’ you with calling family back home and charge you almost $80 for the privilege. To make matters worse we could have avoided the exorbitant fee had we been better prepared and made a note of the dialling out code for Italy and bought a phone card in Venice. It was much harder to come up with the less than favourite list, we really were lucky on our trip and avoided all the major hassles some travellers are unfortunate enough to experience and the problems we did experience could have been avoided with a little preparation. 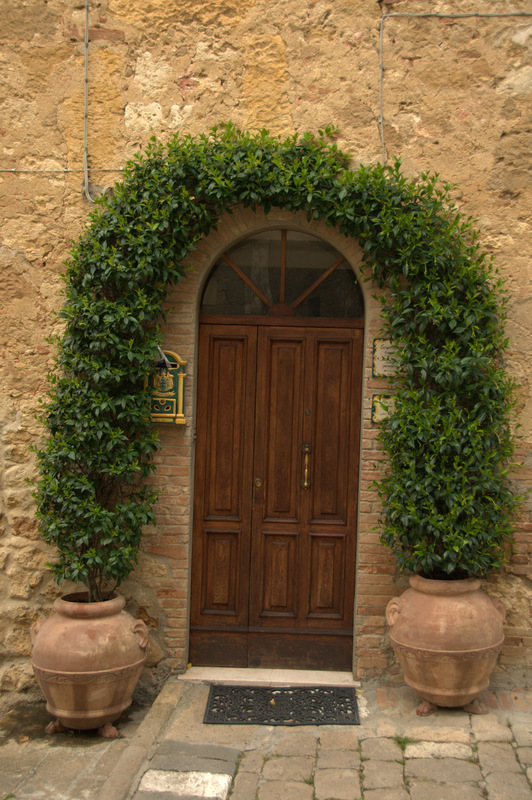 In a previous post I briefly mentioned the hilltop towns we were visiting while in Tuscany and Umbria, they truly are wonderful places to stay especially when they’re not so crowded such as Volterra and Orvieto after the sun goes down. 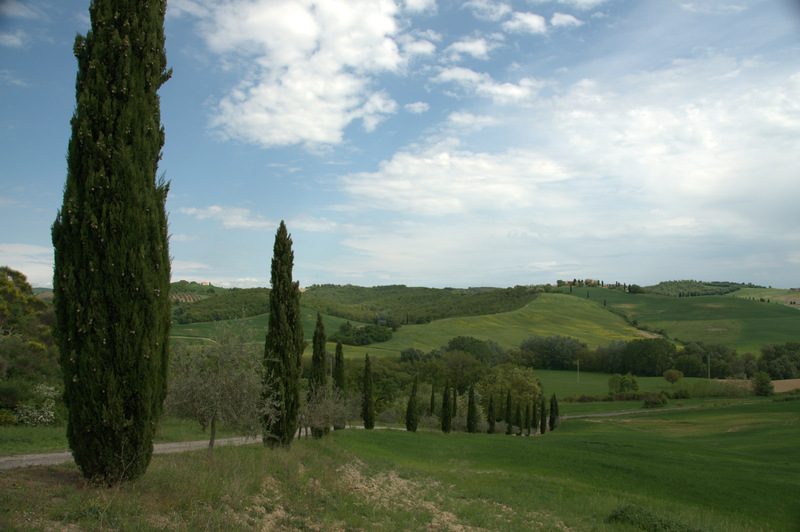 We based ourselves in Siena, Orvieto and Assisi for 10 days and made use of a rental car to travel to the other towns, part of the joy in visiting other towns is the scenic drive through the countryside and taking time to stop occasionally, admire the view and take a couple of photos. From Siena we did a day trip to Volterra and San Gimignano, leaving San Gimignano until the afternoon in the hope that most of the large tour groups had been and gone. 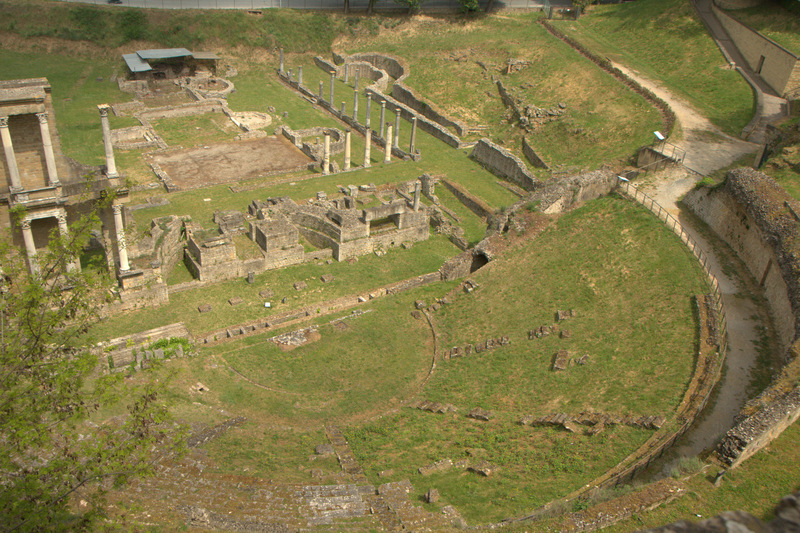 Volterra is probably better known now thanks to the Twilight series of stories, it isn’t why we went there, Volterra is home to roman ruins, alabaster and unbeknown to us, a state prison housed in what looks like a medieval fortress. San Gimignano is a medieval town, famous for its many towers, of which only 14 still stand (there used to be about 70) and I could only count 11 from the Torre Grosse (large tower). 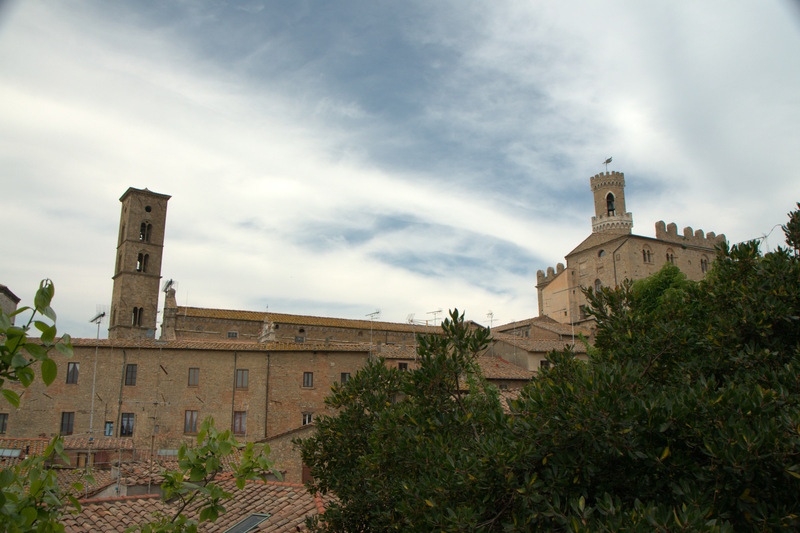 San Gimignano is also home to Vernaccia, a nice white wine that is easy to drink after a long day of sight seeing. 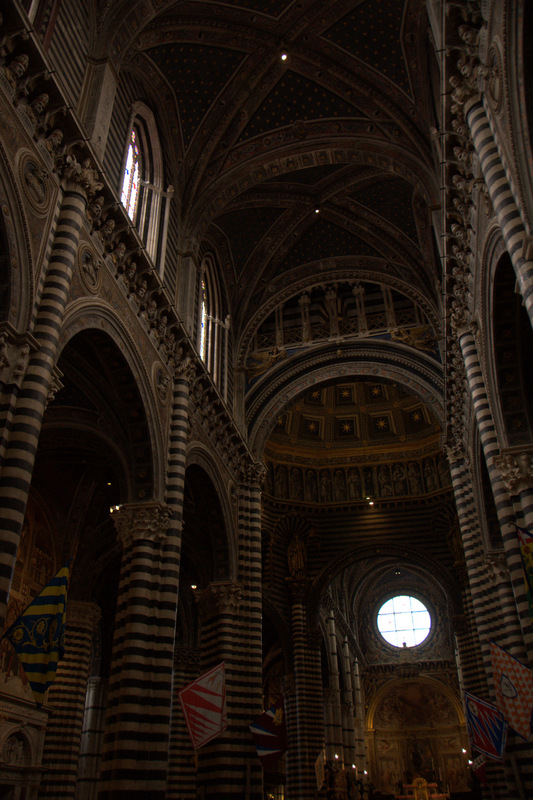 Siena itself is a wonderful city to explore, once we were finally able to find the carpark and our way to Il Campo. The cathedral is a masterpiece of black and white marble, and although Marty wasn’t interested in seeing yet another church I paid the 3 euro admission and took the time to go inside and it was well worth it. 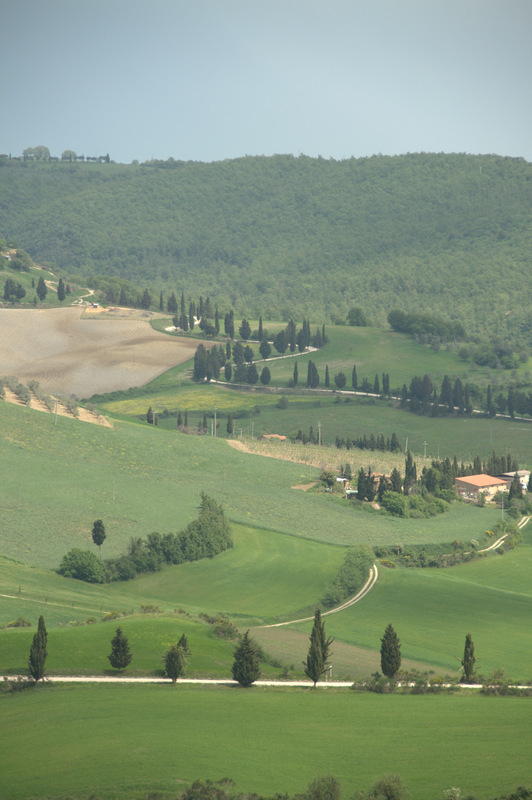 Although we both loved Siena, our day spent driving through the Tuscan countryside to the small town of Pienza was probably more enjoyable. 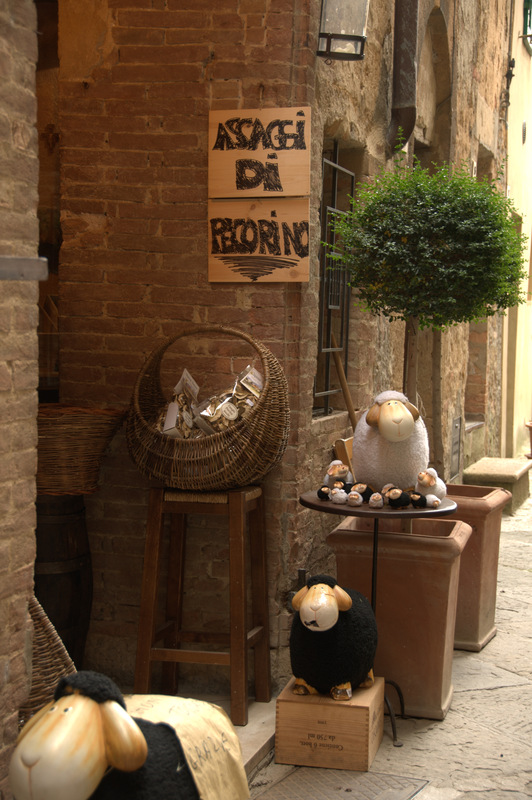 Pienza doesn’t have any major must-see attractions and doesn’t rate that highly in the guidebooks, what it does have is a fantastic view of the quintessential Tuscan countryside and very tasty pecorino cheese (made from sheep’s milk). 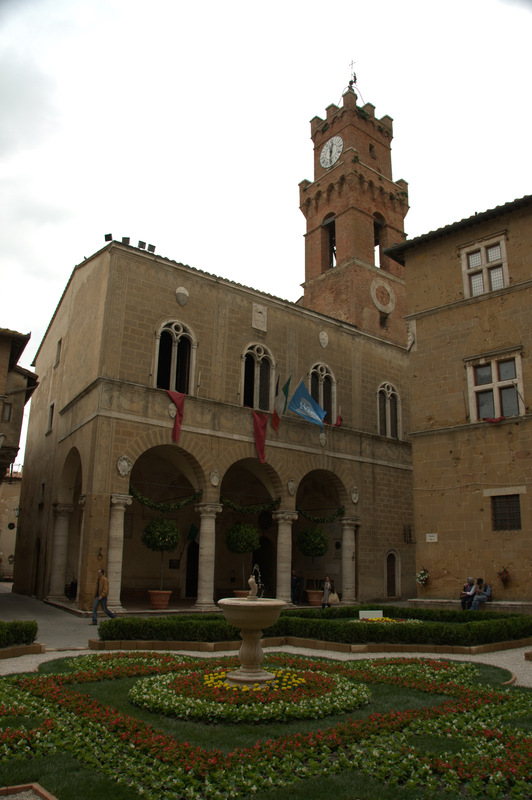 In Pienza we were able to taste a variety of pecorino cheese including slivers of one flavoured with truffles, which I was quite fond of but Marty was left with a not-so pleasant taste in his mouth. We dined at a little bar called La Crete, salami and pecorino sandwiches washed down with a Vernaccia for Marty and a Vino Nobile for me and topped off with very good coffee. 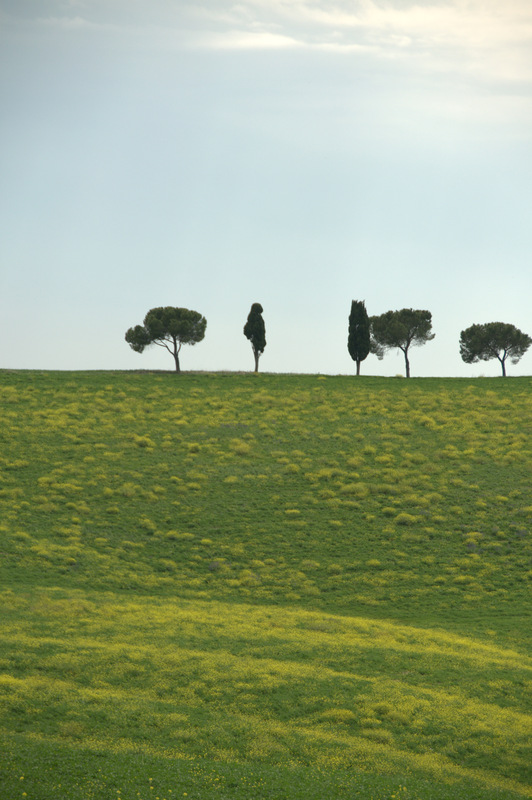 The drive home to Siena was equally spectacular, cypress pines, yellow fields, winding roads, red poppies and olive trees – all the ingredients for a perfect country drive. 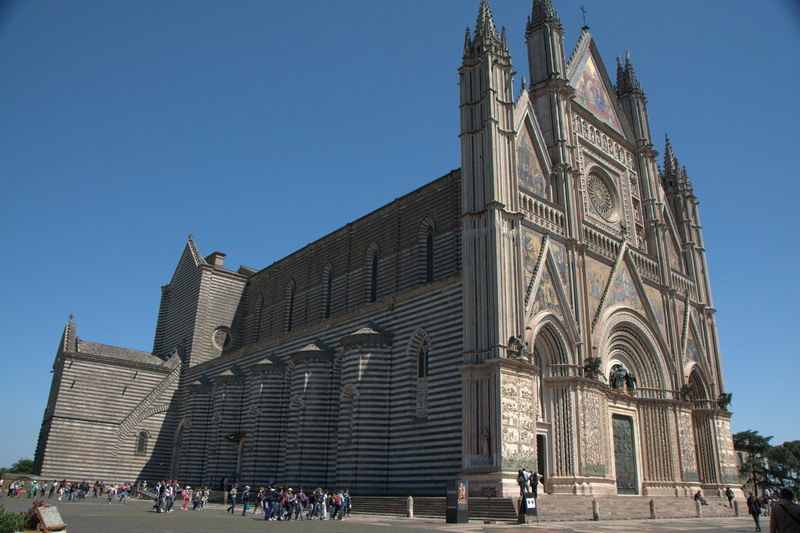 Orvieto is a wonderful town to visit and even better if you can stay within the walls or close by them as we did, providing the opportunity to explore the streets after the tour groups and day trippers go home. From Orvieto we did another day of driving to see Civita de Bagnoregio (the dying town) and Bolsena, Civita de Bagnoregio is a hilltop town with a difference as there are very few residents and it is not swarming with tourists forking out euros in souvenir shops, the town is built of tufa which is slowly eroding causing sections of the hill to collapse and buildings with it. There is no collapsing of buildings while we were there, however we did wish that something would fall on a very loud, foul mouthed american tourist that was part of a small tour group. The drive from Orvieto only takes thirty minutes and after a couple of hours of explorations and one of the best lunches so far we decided to drive to Bolsena on Lake Bolsena. Bolsena is a pretty town, the location on the lake contributing greatly to its appeal and the gelati wasn’t bad either, it is a good place to take a breath and relax by the water but beyond that I couldn’t find the motivation to see more.